And here we see the same man just one year later, no longer able to look directly at the viewer, no longer young. The brim of his cap is misshapen, as if mangled by bullies or forgotten in the rain. He wears badges of desperation, a perm, a dust-thin mustache. Behind him is the unmistakable high stands of a major league stadium, simultaneously claustrophobic and vast. He has made it; there is no joy. On the back of his card there is no trace of his minor league successes, just the thin gruel of numbers of a big league mop-up man. Instead of an encouraging personalized line of text below the numbers, there is this non-sequitur: “At the turn of the century the Chicago Cubs were known as the Colts.” It’s tempting to think the scattered figures in the distance are heckling the man in the extreme foreground, that scorn from strangers is the cause of the complicated expression on Mike Cosgrove’s face. But they are just as likely to be talking about how the Cubs used to be known as the Colts as they are to be talking about, let alone expending the effort to mock, Mike Cosgrove. They really have nothing to do with the likes of Mike Cosgrove. Whatever vague repulsion or sour apprehension rippling his pasty features is his alone, the light from the dirty neon of the pawnshop within. This has been a rough two weeks of ups and downs and I’m both enthralled and repelled by this writing. Enthralled because I can’t believe someone can be this damn good on a consistent basis. Repelled because… well, I wish I could do it. Ah, what the hell. I’m off to try and teach a few to do it like you, Josh. I’m rambling here (a consistent state of mind for yours truly these past two weeks) but I love this piece. Thanks for bringing it in to my life. I might be embarassed after reading this post later on. I’ll live. 2. That second card made me wonder if Will Ferrell was doing a ’70s baseball movie as a followup to his documentary on the old ABA. 3. Yeah, you hit this one out of the dome. I like those Astros hats btw. 5. 3 Your comment about the caps got me thinking of another possible explanation for Cosgrove’s sour expression: humiliation. The stripes on the collar hint at it; below them is, for my money, the ugliest, most garish monstrosity of a uniform ever foisted on major-league ballplayers. 6. Those Astro caps remind me of an oil company logo. Didn’t Texaco have a similar logo at one point? 8. That is one heckuva perm. It’s a little hard to believe, actually, that these photos were taken only one year apart. 9. 7 ,6 … Of course, the star is a common emblem for Texas sporting teams. Kind of similar to how the maple leaf is common to many Canadian teams. It is interesting, however, how both the Houston Oilers and the Houston Rockets have eschewed the star tradition. 10. On that second card, it looks as if Cosgrove has just caught a whiff of human waste. 12. 4 Yes, nice interview. Also some really nicely turned phrases/sentences above, esp. on card 2, e.g., “the unmistakable high stands of a major league stadium, simultaneously claustrophobic and vast”, “the thin gruel of numbers of a big league mop-up man”. Thanks for your ongoing efforts here; they are much appreciated. 13. Google’s Mike Cosgrove collection is dominated by the drummer for Alien Ant Farm. The easy-throwin’ lefty came on in relief of an injured Dave Roberts with one out in the first and threw 8 2/3 innings of shutout relief to beat the Phillies 1-0. And on May 28 of that year, he came on with none out in the first (spelling the unfortunate Tom Griffin) and threw 7 innings of one-run ball to once again get the win. No wonder he looked so cool and confident in ’75. The only thing is that from Topps cards in this and earlier eras is that you can never be sure when the picture was taken. Topps was famous for reusing photos from earlier years. The 1976 Cosgrove had to be taken no earlier than 1975 because that was the first year with that uniform. 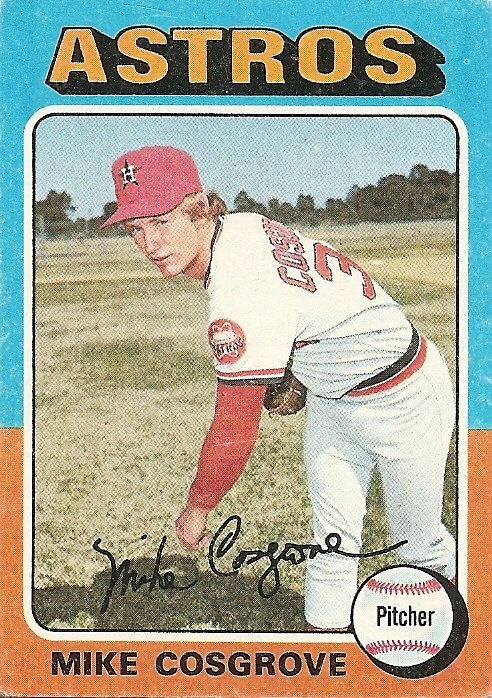 But the 1975 Cosgrove picture could have been taken in from 1971-1974, since that’s when the Astros wore that uniform. Looks like he was just having a bad hair/face day when they took the picture for his 76 card. Perhaps Jose Cruz was standing directly behind the photographer, modeling his brand-new skin-tight, day-glo, rainbow-striped contmporary ensemble for the bemused, somewhat apprehensive reliever? I was going back through the archives and found this post… still think it’s one of your best. 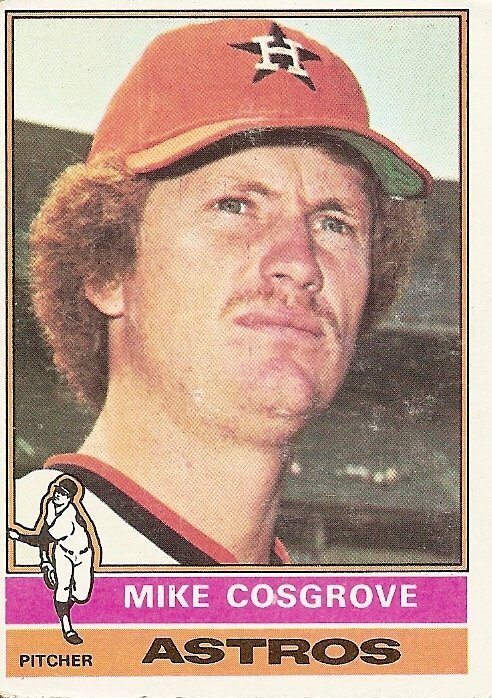 For some reason, certain cards made me feel sad when I looked at them; the ’76 Cosgrove was one of them. The most depressing, however, was this one: http://www.checkoutmycards.com/Cards/Baseball/1975/Topps_Mini/542/Pete_Broberg . I guess the idea that a man of 24 with gray hair like that made me worry about my future. Not for nothing, but those mid-’70’s Astro uni’s seem to divide people into 2 very distinct camps: love ’em or hate ’em. I look at them now through different eyes, but back in the day I thought they were AWESOME. Cesar Cedeno looked like the fastest man alive when he would track a fly ball in that uniform.